A month or so ago I was working on a virtualization article for the print edition of INFOExecutive (formerly Information Week Canada). The article dealt with barriers to virtualization, one of them being USB devices. Or so I thought! My research took me to the web site of Minnesota-based Digi International. Digi originally developed their video, serial, and USB-over-IP devices to support point of sale and kiosk applications. However, they have turned out to be indispensible for virtual and cloud computing applications. 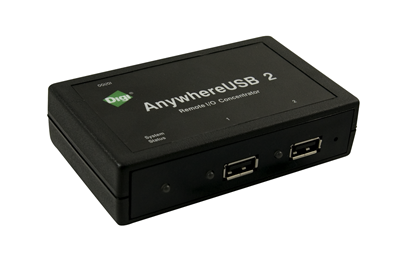 The AnywhereUSB 2 provides, as the name suggests, two USB ports over ethernet. Installation took about 10 minutes from opening the box. I simply plugged AnywhereUSB 2 into power and an available ethernet jack, installed the drivers on my Windows 2008 server (running under VMWare ESXi), went through the very simple software configuration, and I had two USB ports connected to my server. From anywhere. Because AnywhereUSB uses TCP/IP, the server can find it anywhere on the local network, making it ideal for virtual environments. While VMs may move to different physical machines, they’ll still be able to find their USB devices. In my home office I store most of my files on my server and access them from my desktop or notebook computers through file shares or Windows Remote Desktop. I also use a Stealth MXP USB stick with fingerprint biometrics to transport and protect data when I hit the road, but I’d prefer not to carry it around the house. The Digi AnywhereUSB 2 on my desk is a perfect solution. I plug in the USB stick, swipe my finger, and it is automatically connected to a Windows 2008 virtual machine that is physically located in my computer closet. In summary, this little box behaves exactly as advertised, and we tested it on Windows XP and Windows 2008 Server. Windows 7 drivers are expected to be availible in April 2010.